Pine Ridge Bible Camp is an NCEM owned and operated camp located near Beauval, northwestern Saskatchewan. 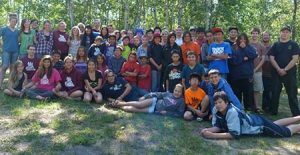 Since 1972 Pine Ridge has been helping First Nations and northern young people develop spiritually, socially, mentally and physically. In this scenic jackpine forest setting, God’s Word is used to lead campers to a meaningful relationship with God and wholesome relationships with other people.